Over the weekend a lot news about MonaVie came across my virtual desk. That’s quite unusual, weekends tend to be a quiet time for news. For those curious what MonaVie is I asked if MonaVie is a scam more than 3 years ago. I was surprised that company was selling bottles of juice at $45 and more surprised from a personal finance perspective that people were buying them. One of the pieces of news was related to that, but let’s save the most interesting stuff for the end. First, I’d like bring up a couple of MonaVie blog posts that people pointed out to me recently. MonaVie to Solve the Recession? So many things come to mind from that statement. On the surface it seems like we can add a new term of “community commerce” to the DoubleSpeak of MLM vs. Network Marketing vs. Direct Selling. MonaVie is best described as multi-level marketing. It isn’t direct selling. Direct selling doesn’t necessary have a multi-level approach to it that the the FTC views as a potential for a pyramid scheme. MonaVie isn’t “community commerce” either. Such a term would apply to an Ebay method of selling, which MonaVie prohibits. Linguistics aside, let’s get to the question of the billion people who never be employed. First, MonaVie doesn’t cite where that number comes from. Second, as the blog post points out, that the situation is bleakest in third world countries. MonaVie is not available in most of them. The other thing that MonaVie doesn’t mention – to be a distributor of MonaVie, you have to buy about $1700 of product a year. The very first person commenting on the post got the message, “…however not successful passing the message due to the high cost of the product, when people don’t have money they don’t buy a health beverage for $143 a case every months.” Ignoring his grammar, the message is obvious, unemployed people shouldn’t be paying $1700 a year for the juice. This can only be more true, when there are people in third world countries where $45 is a life-changing amount of money. How much rice can be bought for $45 to feed the hungry? Is 100 pounds an exaggeration (about 50 cents a pound when bought in bulk) or is that conservative? That will get you 25 ounces of MonaVie. Who are you going to get to buy your $45 juice? Every MonaVie distributor knows that first thing people cut when times aren’t good are luxury items like the Rolex watches, Tiffany’s jewelry, and $45 juices. 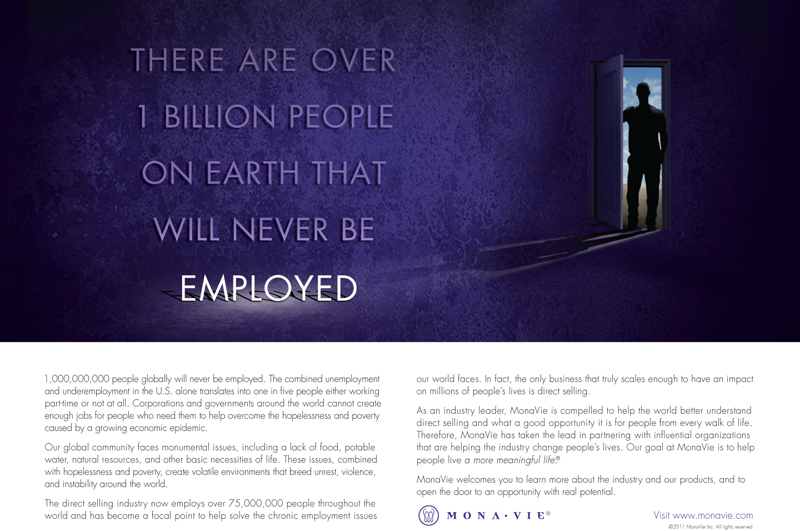 “People today are paying more than two cases of MonaVie juice a month to go to a job they hate! Add up the cost of gas, clothes, childcare and food monthly. MonaVie offers the greatest opportunity return for the ‘COST’ of my time and money!” There are costs associated with most jobs, but MonaVie is no exception. The $1700 in product is a big one. However, there are others such as gas, conference fees, hotel events, tools to sell the product, etc. As we’ll find out 99% of people don’t even make enough to cover the product. “It’s unfortunate, because long-term most will continue being broke for years to come wasting their money on cigarettes, alcohol, clothes, makeup, coffees, pops and other junk foods and fast foods, etc.” MonaVie replaces none of these things. It is just one more expense to add to all the others. The distributors seem suggest that people give up things that they love, so that they can buy a $45 bottle of juice, which, by the way, lacks nutrition. The FTC and FDA are quite clear that a comparison between a juice and medication can’t be made. As for getting our daily requirement of fruits and vegetables, here’s a form from the CDC, Fruits and Veggies Matter website. According to it, I (a 35 year old male with moderate exercise) need 2 cups of fruit and 3.5 cups of vegetables. According to the same website, 4 ounces of MonaVie’s 100% fruit juice counts as a 1/2 cup of fruit. At $1.43 an ounce, my fruit would cost $22.88 of MonaVie juice and the website is clear to point out that it would be less than ideal since it wouldn’t have fiber that fruit has. MonaVie also contains no vegetables, so I’m out of luck there. Commenter Dave W. Clark doesn’t seem to understand this, “The Dietary Standards of the United States are changing to http://myplate.gov (50% vegi’s and fruits) on every meal. The cost and storage of vegatables alone is quite costly.” Clearly MonaVie is much more expensive. You’ll have to click it to see the larger version, but one thing you’ll find is that MonaVie claims that “direct selling employs 75,000,000 people” (notice that they emphasize all the zeros rather than just say million). That’s an odd phrase. First when they talk of “direct selling” do they mean the MLM type or the traditional type (like a door-to-door salesman or an Ebay sale). Typically with “direct selling” they mean MLM, but if they are including non-MLM businesses then MonaVie has no business conflating the two very separate enterprises. The other thing odd about the sentence is the term “employs.” It is well-known that distributors are Independent Business Owners (IBOs) and are not employees, which is how MonaVie can get away with paying less than minimum wage (on average), providing them with no benefits (such as health, eye care, or dental for example), and require them to buy product to earn their income. You’d think that would be the most interesting part: attempting to solve a lack of employment, by offering a solution that DOESN’T employ people. However, it gets worse. We found that over 95% of participants must lose money MonaVie’s compensation plan – and that’s the best case scenario. In terms of the practical, real world case, over 99% of MonaVie distributors lose money! 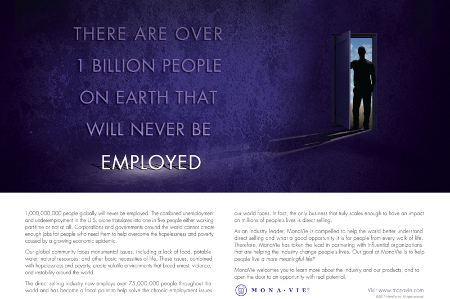 MonaVie is offering a solution to the recession that is worse than going to casino and putting your money on the roulette wheel. When you match up the timeline from the tipster and the publishing of this post, one has to wonder how a company could be more insensitive. More important though, how can being a MonaVie distributor be a global solution for unemployment or underemployment, when the company itself can’t scale to support the few number of actual employees it has? The final piece of news is that MonaVie was hit with a class action lawsuit in Arkansas. You can read the a PDF of the complaint on MonaVie’s website. The 40 pages go into great detail and yet only cover about 1/5th of the information that’s available on MonaVie Scam. I’m glad that pointed out that Lou Niles dressed up in surgical scrubs and pretended he was an oncologist in a famous video that been seen on YouTube tens, maybe hundreds, of thousands of times. The suit also makes a point to compare MonaVie to the CEO’s Dallin Larsen’s previous juice company, Royal Tongan Limu, where the Department of Justice and FTC raided the warehouses and destroyed the product due to the level of illegal claim. The comparisons are shocking. The lawsuit in Arkansas is dead on about every point. Think about Joyce Schmitz comment above of “Cheaper than medication and much better for you too.” These are the comments that MonaVie is allowing to be published on their very website. The comment has been there for over a month too. The only thing that I found disappointing in this lawsuit is that Joel Neal Oliver, nor his lawyers contacted me so I could give them even more information. If you are involved in MonaVie, thinking of getting involved, you owe it to yourself to read the complaint. If you know someone involved, I hope you will forward this post to them before it’s too late. If MonaVie goes out of business the distributors lose their income too. This document retention notification was, by court order, sent to all of the company’s distributors; thus, they have been duly informed that if they were to delete such online content at this point, they could be held in contempt. Also, what’s up with this “scalable” model nonsense they keep harping about? Did some jackass at HQ suddenly dream up the idea that “scalable” should become the new buzzword for Monavie? It’s completely inappropriate because Monavie is far from scalable. Were it to “scale down”, the pyramid would collapse, and there is a clear limit on how much it can be “scaled up”, given that pyramid models like this can only grow to a point before they become mathematically unsustainable and implode. In addition, while scaling up would benefit the execs and kingpins, it would undermine existing distributors by putting them in competition with new distributors. There’s also the fact that the product isn’t being sold in most of the world so there’s a limit on international scalability as well. Furthermore, aside from all these other points, there is nothing unique intrinsic to Monavie’s MLM model that would make it any more scalable than any other business model. Scalable typically refers to the ability to adjust production to meet demand. As we all know, demand for Monavie among retail consumers is virtually nonexistent. When Monavie’s second rate spin doctors refer to scalability, I think that all they really mean is that they will sell a distributor ship, and all the false hope along with it, to anyone foolish enough to take the bait. In other words, the product that Monavie really sells is distributorships — not juice — and their supply of distributorships is theoretically infinite because the company has no reason to not sell as many distributorships as they can, regardless of demand for the product. Contrast that with any non MLM company, where the goal is to SCALE the sales force to meet the demand for and ability to supply the product. The optimal size of the sales force is predetermined based on a careful assessment of the market (e.g., sales forecasts), and it is finite. Talk about missing the forest for the trees with the comments about the global community. If you’re in an impoverished village in Africa, with your daily goal of finding enough clean water and food to survive another day. You’re going to spend $1700 to buy juice to sell to your friends? As you mention, the $45 is going to be better spent on rice, water, or any of the basic building blocks. MovaVie isn’t going to keep you from dying from starvation. Thank you for another well-written, articulate piece. Thank you also to those who comment on your pieces, bringing new or hidden information to light. The only thing with scales here are the snakes running this company. Perhaps scalability is determined by how quickly and often they can shed their skin to try and distract the public from the truth. It’s funny that they think they are part of the global community. Even more funny that they think they are doing something good for the global community. The only good coming from them is a warning (I hope). Excellent article, as usual LM!! I understand the concept of marketing but Monavie’s “campaign” is so ridiculous in it’s claims, it is like telling the world that unicorns exist and that Monavie helped invent them. I don’t think that ad campaigns like this will help them much in court…. Vogel, the word du jour, “scalable” ought only to be used by MonaVie in the context of their own “employability” …umm…ability. People actually employed by MonaVie are losing their jobs and THAT best reflects the “demand” of the product. My heart goes out to those that have lost their jobs but I think that there is a silver lining. Hopefully those 50 people and those that may follow, will be able to secure themselves other employment and distance themselves from any association with this “company” when it is inevitably shut down and publicly disgraced. Truthwillsetyoufree…I LOVE your snake analogy and it is fitting on so many levels. These “skins” that are being shed can also represent the previous “companies” that these people were involved with that were shut down. They shed them, then move on with their “new skin”,(hoping people will forget the colors of their old skin) to poison victims with their venomous lies. So MonaVie is paying for advertisement? I thought one of the glorious benefits of MLM was that the companies save money by not advertising, instead letting the distributors spread the good word. I guess we add this to the list of times MV has paid for ads, like that lame pseudo-documentary-infomercial they aired on TV earlier this year, and those sports team sponsorships. And add it to the double-speak and deception of MLM in general and MV in particular. Really? What is the measurement of quality here? It is fruit juice and there isn’t a single piece of compelling evidence that it is better than the juice your grocer sells at $3. All independent opinions on the web (Men’s Journal, Dr. Weir, Dr. Bowden at HuffPo, Dr. Dean Edell and others) emphatically state it’s a ripoff. So how does MonaVie shine? The mindless distributors’ reasoning is that it is much more expensive therefore it must be high quality and because it is high quality it must be very expensive. “I Will Teach You To Be Rich: Cheap people care about the cost of something. Frugal people care about the value of something. So even though we now know that MonaVie isn’t quality, the original question I was asking was, “How you do simply make juice be 20x the quality to justify the 20x price try to sell that to the average American public?” We know the answer is now the illegal health claims combined with having to buy the juice as an admission ticket to a business opportunity that is misleading the public. I agree and great article! I am thankful for you all and LM for putting these articles out, for those and myself can see how they intentionally keep the public ignorant and this site and others allows others to see the truth behind their false and misleading statements. This is a slap in the face as ‘the truth will set you free’ stated; to those who have lost their jobs. They are not a part of the solution..They are the PROBLEM..they do everything in their power to keep the real truth hidden and from coming out; and that is where they shine! I got sucked into an MLM business a few years back. They get you all hyped up and believing that you will sell the product to so many people that those people will want to sell it too! Then you don’t have to sell anymore. All you have to do is get 5 to get 5. What a crock of bull! I have friends who have been sucked into the Team MV scam. They’ve bought it, hook, line and sinker and I’m extremely concerned for them. I know the company is going down, and it’s just a matter of time when. I have been fact gathering, and I noticed that on this site or the juicescam site, you said that MV had a BBB rating of D-, but when I checked this on the BBB website, I found an A+ rating. Can you clarify where you got this info? Thanks. I just sent you a detailed email, but the short answer is: Did MonaVie Pay For a Better Grade from the Better Business Bureau? Tyson, you should read this article that shows MonaVie is a grossly overpriced product, with little nutritional value, wrapped in a poor business opportunity that appears to be illegal pyramid scheme, supported by nonsensical “scientific” studies and illegal medical claims. You only show to prove by illegally claiming that it helped your back problems (yes, it is an illegal because you are distributor and this is a violation of the FTC endorsement guidelines as well against MonaVie’s policies and procedures). Please learn about MLM and how you aren’t really helping others make money. You need to indirectly get dozens of people to pay $1500 for $100 worth of juice a year just to break even. It’s not illegal for me to say soemthing helped me, that’s a personal situtation that it helped me. It would be illegal for me to say it will help you in any way…that would be illegal, what I said is not illegal… it may not help you… so is there anyone where you work that is your boss and makes more money then you. If you work hard you would be promoted too. So the people that lost their jobs would be collects EI or welfare but, they are not… they are making their own money. “The Federal Trade Commission (FTC) recently came out with revised guidelines in regards to endorsements and testimonials effective Dec 1, 2009 (yes that’s today!). This post is in no means a scare tactic, nor does MonaVie intend to silence its distributors, but this is to inform and to help explain the new FTC guidelines in which all of us must operate. MonaVie wants to make sure all of its distributors are aware of these changes and requires all of its distributors to comply with the new guidelines. 1. MonaVie distributors who provide testimonials online AND offline must be truthful AND be subject to typical results. If you are a distributor and want to share your story or testimonial anywhere, first ask yourself if the results can be typical? Thus testimonials about MonaVie products or money making opportunities must conform to MonaVie approved statements. The advertiser must have adequate substantiation for any experience described by the endorser, i.e- typical results. Gone are the days of simply posting ‘results may vary’. It is not a typical result for MonaVie to help people with back problems. MonaVie isn’t approved by the FDA to treat or cure any back problems. According to not only the FTC, but also MonaVie, you can not make this claim. As MonaVie addresses it isn’t whether it helped you or whether it may help me, it is about what is the typical case. Your talk of bosses making more than you has nothing to do with MonaVie in any way. Over 99.5% of people lose money in MonaVie… clearly they aren’t making their own money, they are losing it. yup lots of people do not stick with it.. the ones who do and work make money… I am. That is jsut fine with me, it’s something I can do on the side and earn some nice extra $$ because I work for it. If you are losing moeny somethings not right… I wouldn’t do anything where I lose money. All I know is my back got much better when I started to take it… and after 3 years of morphine, I’d rather drink this then take that addicting drug… plus get paid for it. I see lots of people making money and I see people quitting before they have the chance. It’s Not a Matter of Effort, it’s a Mathematical Certainty. so if you claim the juice doesn’t do anything what about the all natural energy drink, or the weight loss which I personally know people that have lsot tons of weight, or what about the vitamins…. You can get similar sugar and caffeine in a can of Mountain Dew, for a lot cheaper. Of course if you wanted to do it the natural way you could take a half NoDoz tablet and put it in any 100% fruit juice and still have about the same sugar and caffeine in an all natural beverage for about 10 cents a serving or less… a huge savings over the price of MonaVie’s energy drinks. People lose weight with diet and exercise. It’s basic calories in vs. calories out. There’s nothing special in MonaVie’s products that help with it any more than say Slim Fast or Carnation Instant Breakfast. People lose weight on the Cookie Diet for an example of how ridiculous it is to say, “I personally know people that have lost tons of weight.” Another MLM weight loss has been dissected at http://www.lazymanandmoney.com/visalus-scam/. Same principles apply… far over-priced product. Every MLM company has overpriced vitamins. This USA Today article discusses MLMs and their vitamins because they are high margin. They compare the cost of Amway’s NutriLite to a comparable GNC product and the GNC product is twice as much for half the product. All MLMs are the same way. They’ll say that their vitamins are of a higher quality, but as long as they are USP verified, they are all pure, the best you can get. This is discussion is covered in detail with regard to the MLM Youngevity here. That’s why you end up paying $45 for 25 ounces of juice or expensive prices for energy drink and weight loss products. They are overpriced because they are designed to profit from workforce. A small minority of the workforce, the 0.46% may make money, but MonaVie doesn’t mind that if it’s getting the 99.54% grossly overpaying or product. All I know is last month.. I held a couple “tastings” and sold only a few kits… and I got a nice comission, plus we got one of the 2000 bonuses, and also all inclusive trip to SAn Diego…which would have cost me alot of money, the flight alone Instead they picked up the both of our flights, hotels, meals, and we had a great time… well it’s working for me and some of hte other people I helped and we are being rewareded… and for some strange reason I don’t have pain anymore, and no failed marriage here, it’s actually something me and my wife can do together and we have a lot of fun at it. I still have my day job and this is something that we do 2 nights a week for 2 hours each night. Part of the issue is the “all I know” that you started out with. It is not typical to sell a few kits and get an all-inclusive trip out of it. If you had read the article about only sharing typical claims, you’d know that you couldn’t share this information. It’s a lot of fun if you just sell three kits and get a free trip to San Diego. It is a lot less fun when you spend $3000 a year on juice for the two of you and end up making less than $150 in commissions. hmmmm you make more then 150 comission on one kit. I did infact get a trip to San Diego for my wife and I. That trip only cost me a few drinks on the plane, other then that not a cent. Yes it was a lot of fun. As far as my back, I would go to the local hospital once ever 2-3 weeks and get a shot in the spine and was told that I would need that the rest of my life… I haven’t had one in 13 months. I don’t really care about what you tell me is happening… I couldn’t move for days, there were nights where I thought I was going to wet myself because the pain to get out of bed wasn’t worth it, and it’s gone…and that is the best thing that has ever happend in my life, I can play with my kids, I can go for walks. To me it worked…. I wasn’t quite sure what a kit was because MonaVie has added and changed their products every few months now. It used to be just the juice and you could sell people a case (typically) at $150 or so. Once MonaVie’s business started to tank they’ve decided to add more products such as the weight loss products and I guess vitamins now (from what you are saying) to squeeze out more and more money from each distributor. Anyway, I hope you aren’t selling these kits at $700. That’s ridiculously expensive for what it is which bring you back to the point that I made above that they are intentionally overpricing their products to rip people off. I don’t care if you feel MonaVie helped you, just stop breaking the FTC guidelines and MonaVie’s policies and procedures by telling people about it. If the product could help with people’s backs, MonaVie would get the product approved for it by the FDA and make tens of billions of dollars a year. They don’t because they know it doesn’t work. I’m not telling anyone it will work for them…. you are saying that I am…not once have I ever said “it will work for you” I am telling people that I have a decent check, and a trip under my belt in a short time. Have I worked for it…yes. Have I worked real hard for it…nope, not really…. I’m making it work. Will I let someone like you tell me I cant or wont make money at it, no way. Tyson, will you please read and comprehend the information that MonaVie presents to you. I never suggested that you were saying that MonaVie will work for other people. I simply said that you are not allowed to tell your personal testimony of MonaVie once you signed up as a distributor, because it isn’t an approved, typical, case. This is MonaVie and the FTC telling you that you can’t – not me. If you want to continue to defraud others in an attempt to make money that’s your own personal decision. What a lie this business is! I have been watching the Monavie videos and what a load of crap! Don’t people get it, “The Monavie leaders” are already in place!! There’s 10’s of thousands of people making $35.00 a week. Jusuru is worse $50.00 a bottle!! These poor people need to add up the gas, time, food, meetings, etc, they spend. What a shame. Who are the Jusuru leaders. They are having a big meeting in September. We will be watching you. So what about the new scanner they are coing out with… the takes a sample of your levels… and if they do not get better in a couple months with taking any of hteir products you get your money back… there are some really legit people involved in this business that wouldn’t risk their name on somethign that doesn’t work…mark macdonald, rex crain.. Sample of your levels of what? Nuskin, another MLM, has had a scanner for a few years and I’ve been meaning to write about it a scam as well. Rex Crain looks like a motivational speaker. These are the very people that MLM organizations hire. He certainly doesn’t seem to have any medical background. and having clients like kanye west, Seal, Heidi klum, kobe bryant…. would he be involved with a camopnay that may be misleading…what about mark macdonald? Would he ruin everything he has worked for and a contract with CNN? What kind of medical back ground do you have? Well, having clients like Kanye West and Kobe Bryant… that’s something NOT to be bragging about. Seal and Heidi Klum are (or were) married, so really they count as the same client (same household). I don’t see anything that incredible about Mark MacDonald’s resume. I hadn’t heard of him. He’s certainly not up there with Dr. Weil who gives a thumb down on MonaVie: http://www.drweil.com/drw/u/QAA400351/Thumbs-Down-on-MonaVie.html. Again the important thing to note is if there is a financial relationship between the company and these people. There usually is. As long as the product is fairly healthy they’ll have no problem putting their name to it for the right price. ViSalus has the same things as does Weight Watchers and (I think) Slim Fast. Ignore the paid spokesmen. Ignore the gimmicks like MonaVie. There is no magic diet. We’ve all known the answers for years – eat healthy and exercise. Follow Nike’s slogan… just do it. Why are you interested in me? I’m not competing for your money in any way. I also have never claimed to be a medical expert. What I can tell you is that this website has over 4 million hits, but again, I’m not sure why you care. I would be very surprised if 33 million paid to see Rex Crain. If they each paid a single dollar, which would be extraordinarily cheap, and no one ever paid twice, he’d have at least $33 million dollars. If someone has that many paying customers they typically have a Wikipedia page. He bills himself as an author on his website and yet he has one out of print book on Amazon with 3 reviews. Again, you are talking about paid spokespeople in Rex Craig and Mark MacDonald. When I write about MonaVie, I do it to help consumers… I am not paid by any company to say the things I say, so you can trust that they are genuine. Do they disclose their paid spokesmen status in their videos as required by the FTC endorsement guidelines: http://ftc.gov/os/2009/10/091005revisedendorsementguides.pdf (PDF). If not, you are talking about these people performing potentially illegal acts. Again, I don’t care whether you think I am someone or not. I’m not pretending to be anybody. I’m just helping alert consumers so that they don’t get scammed. is there a way to get involved in the class action lawsuit? I lost roughly $5k and a good friend bc of this company. Kevin, I’d have your lawyer look into it. He or she will probably give you accurate advice. I”m sorry I was reading both articles. I never was involved in Vi. I never liked the product. I read that one first and followed up with the mona vie one bc I was involved in it. Total mistake. My apologies.